Source: Baum, L. F. (1918). The Tin Woodman of Oz. J. R. Neill (Ed.). The character of the Tin Woodman is revealed through a retelling of how he became made of tin. In recounting the tale of how the Tin Man came into being, Woot the Wanderer points out the Tin Man’s duty to marry the girl that saved him from the Witch and free her from the Wicked Witch. The Tin Man, the Scarecrow, and Woot set out on an adventure to save the girl. Woot, the Tin Man, and the Scarecrow embark on their journey to find Nimmie Amee. They discuss the route they will take and the dangers they may encounter. The Tin Man and the Scarecrow discuss the benefits of not being human. The Scarecrow recites poetry to entertain them along the way. Woot, the Tin Man, and the Scarecrow continue on their journey. They decide to explore the city of the Loons and discover curious creatures that capture them. They escape and continue on their journey, their curiosity satisfied. Woot, the Tin Man, and the Scarecrow are captured by a giantess for her amusement. She tells them she will transform them so that they can’t be found and rescued by their friends, the Wizard of Oz and Dorothy. Woot, the Tin Man, and the Scarecrow try to convince the giantess not to transform them. It does not work and she transforms them into a tin owl, a stuffed bear, and a green monkey. They are left alone to contemplate their predicament. Woot, the Tin Man, and the Scarecrow discuss their predicament with the Canary. The Canary informs them of the magic apron that can open any door or window in the enchanted castle. The captives plan their escape. The friends encounter a hungry jaguar that threatens to eat Woot. Woot uses the magic apron to escape. Woot finds himself in the lair of hungry dragons. He again uses the magic apron to escape. With the aid of the now satisfied jaguar, he returns to his friends. The friends meet a new character, Tommy Kwikstep. Tommy was transformed into a creature with twenty legs because he spoke without thinking. The friends find their way to Jinjur with the hope she will direct them to Glenda the Good so that they can be returned to their former selves. The author introduces Dorothy and Ozma of Oz. Oz had once been a land like any other until Queen Lurine transformed it into a fairyland. Dorothy uses her magic picture and learns of the terrible fate of her friends the Tin Man and the Scarecrow. Ozma and Dorothy embark on a journey to find their friends. Ozma uses her powers to transform the friends into to their original forms. However, when it came to Woot’s turn there was a problem because he had been in human form originally. With Polychrome’s help they discover a solution that may work. Ozma magically changes the wicked giantess, Mrs. Yoop, into a boy then into a green monkey and reverses the curse that Mrs. Yoop put on Woot the wanderer. As a green monkey she will have no more magical powers and will be forced to eat what other monkeys eat. The friends reach the Tin Man’s birthplace and discover a Tin Soldier. The Scarecrow uses the Tin Man’s oil to unrust him. He begins marching around, citing a poem. The Tin Soldier tells the Tin Man and his friends how he came to be made of Tin. His story surprises them. They continue on their journey to find Nimmie Amee. When they arrive at Nimmie Amee’s house it has been abandoned. They decide to venture to Ku-Klip’s workshop to see if he knows where she has gone. The Tin Woodman discovers something and commands the others to stop. The Tin Man finds his head in a cupboard and argues with it. Ku-Klip returns and tells them about Chopfyt. The friends continue on their journey. The friends proceed into an area that renders them invisible. They cannot see themselves or each other. A hippogyraf approaches them and begins sniffing about for the straw he smelled. They make it to the end of the Invisible Country only to find themselves trapped because of a wide ditch they could not cross. The travelers arrive at Professor Swyne’s farm and spend the night. The Tin Woodman, the Tin Soldier, Woot, Scarecrow and Polychrome look for Nimmie Amee so that the two tin men can ask her to marry them. The group discovers her house but it is surrounded by an invisible wall. The Blue Rabbit and Polychrome help the group to go under the wall and get to the house. The Tin Man finally finds Nimmie Amee, but to his surprise she is happily married to Chopfyt. Polychrome finds her rainbow and returns to her father and sisters. They return to the Emerald City and recount their adventures to Ozma. Baum, L. Frank. The Tin Woodman of Oz. Lit2Go Edition. 1918. Web. 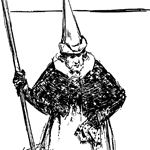 <https://etc.usf.edu/lit2go/25/the-tin-woodman-of-oz/>. April 21, 2019. L. Frank Baum, The Tin Woodman of Oz, Li2Go edition, (1918), accessed April 21, 2019, https://etc.usf.edu/lit2go/25/the-tin-woodman-of-oz/.